As it is reported, traditional surgery usually makes patients painful and causes a lot of side effects. Nowadays, there is a new minimally invasive technology in medical field which brings hope of “good efficacy, small trauma and few side effects” to cancer patients. Minimally invasive technology is a therapy with small trauma to get largest treatment efficacy, which gradually becomes the first choice of cancer patients. Radioactive particle and chemical particle combined implantation is one of the minimally invasive technologies. 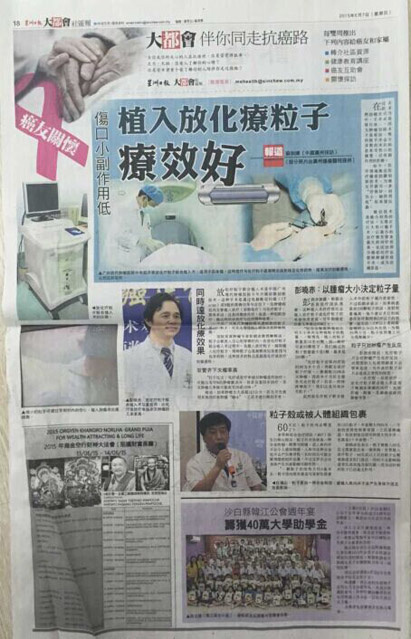 Modern Cancer Hospital Guangzhou introduces radioactive particle and chemical particle combined implantation this year. Radioactive particle and chemical particle combined implantation is led and located by CT and B ultrasound and to implant radioactive particle and chemical particle into tumor alternatively. It is concurrent radiotherapy and chemotherapy and it is also a short distance therapy, which can get two efficacies of radiotherapy and chemotherapy. Cancer expert of Modern Cancer Hospital Guangzhou, Peng Xiaochi, explains that single therapy of chemotherapy or radiotherapy only can kill 70% of tumor. If chemotherapy and radiotherapy are combined to treat cancer, the rate of killing tumor will increase to 90% to 100%. He claims that according to the observation in Modern Cancer Hospital Guangzhou, radioactive particle and chemical particle combined implantation therapy has a better efficacy than single therapy of chemotherapy or radiotherapy. Especially for cancer in early stage, 95% cancer patients can reach clinical effects. Radioactive particle and chemical particle combined implantation is applied to advanced solid tumor treatment, such as lung cancer, liver cancer, breast cancer, prostate cancer, etc. Expert of cancer minimally invasive therapy in Modern Cancer Hospital Guangzhou, Bai Haishan, further elucidates that particle is made of alloy. If the particle is implanted into body, people will not feel any pricking. Body will not reject this kind of alloy; for a long time alloy will be surrounded by the nearby tissue and will not bring any side effects.